The State bank of India or similar SBI has recently invited online application of 300 special Management Executive month of August 2014. Interested candidates can submit their applications start from 24 July 2014 to 11 August 2014. Get further details of 300 Special Management Executive (Banking) like Eligibility criteria, selection procedure, date of examination, center of examination, how to apply, exam pattern (syllabus) call letter for the examination, pay scale, age limit and general instruction for filling on-line of SBI special management executive is given below. Selection Procedure and Exam pattern for test: As per notification the applicants will choose on the basis of written test, group discussion and interview. The selection divide into three phase, Phase I is written test, Phase II group discussion and final selection is Phase III interviews. Exam/ Test pattern for the SBI 300 Special Management Executive (MMGS) is objective test and descriptive test. Phase II for Group discussion (20 marks) and interviews (30 marks). Final selection who qualified Phase I and will get good marks in phase II. How to apply: for detailed guidelines i.e. application registrations, photograph & scan & upload visit at bank website www.statebankofindia.com or www.sbi.co.in à “CAREERS WITH US” à Recruitment of Special Management Executive (Banking) in State Bank of India. 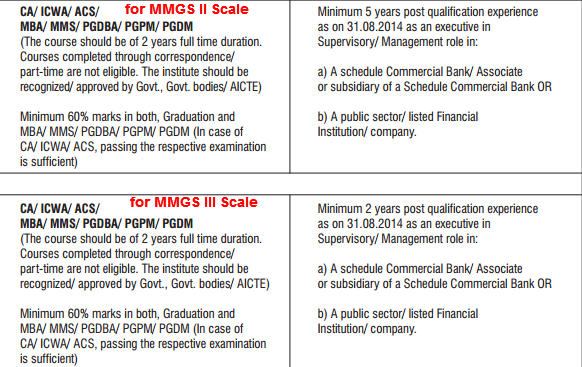 Call Letter for the examination of 300 Special Management Executive for the MMGS II and MMGS III scale: The applicants can download their call letter after 05 September 2014 from the bank website. Admit card/ call letter is that you help to enter the hall ticket. Hall ticket contains your name, roll no, examination centre etc.